LONG BEACH.—The Akira Komai Memorial NAU playoffs concluded with four games on Sunday at Rancho Dominguez Preparatory School. Pacific Pride Quicksilver survived a tough battle to capture the Southern California AA title. Clippers walked away with the crown in Aye Plus, Precise took the Aye Major title, and Marina Tigers grabbed Aye Minor honors. See photos from the NAU Southern California finals here. Mark Nitake found his hot hand, scoring 13 of his team’s 18 points in the game’s final 5:24 to lead Quicksilver past a short-handed Nakatani team, 72-69. Nakatani led 58-54 when Nitake took over. Dribbling behind a screen, he swished a trey from the left wing and completed a four-point play to tie the game. After Jimmy Miyasaka pushed Nakatani ahead with his baseline jumper, Nitake dropped in another trey, this one a jumper from the right wing for a Quiksilver lead, 61-60. Jarrod Carroll turned a steal and a split the defense for a layup with 4:31 remaining, 63-60. Nitake finished an up-and-under drive, 65-60, and 2:52 left. Miyasaka tried to lift Nakatani back but Nitake and a triple from J. Carroll made it 70-64 with 1:02 left. Nitake’s free throws with 22.7 seconds on the clock was just enough to keep Pacific Pride on top. Nitake led Quicksilver with 27 points and was given balanced team support in all areas. Miyasaka topped Nakatani with 24 points. Nakatani lost one player to injury in the first half, had two players whistled for four fouls in the first half and their point guard was down with another injury. Offensive Rebounds (8). Steals (4). Turnovers (17): Kawahito 7, Shimizu 3, Miyasaka 3. Offensive Rebounds (9). Steals (8). Blocked Shots (1): A. Carroll. Turnovers (9): M. Nitake 5. Clippers started off with an 11-zip lead, which they never relinquished. They ended up with a 58-48 triumph over Coast Tigers. Playing a penetrate-and-kick offense, five Clippers connected for their 11-0 lead, less than 5 minutes into the game. Joe Tessler and Randy Lee rallied the Tigers and they cut the lead down to 17-13. Clippers continued to apply pressure, breaking down the defense for layups. Brett Setsuda and Hiroto Sugano made five of them as the Clipper lead grew to 31-21 at intermission. Eric Nguyen’s ball-handling allowed Clips to stay in control. They built their lead to 43-25 with 11:28 remaining. Coast tried to rally again behind the efforts of Jonathan Tessler. Joe Tessler’s old-fashioned three-point play cut the deficit down to 49-39 and 5:26 left in the game. Clippers made 7 of 11 free throws down the stretch, more than enough as the Tiger rally ran out of steam. Offensive Rebounds (12): Setsuda 5, Young 3. Blocked Shots (4): C. Azzam 2, Sugano 2. Turnovers (16): Sugano 6, Nguyen 3. Offensive Rebounds (9): Joe Tesslet 3. Blocked Shots (2): Kwan, Joe Tessler. Turnovers (13): Joe Tessler 3, Jung 3. Riding the youthful legs of Ryan Yoshida and the experience of Eric Yung, Precise dominated 38 Degrees, 73-52. The two teams traded tallies early in the game until Yoshida, coming from San Diego, was ready to play. His first shot air-balled from the right sideline, then he went on a roll. His jumper from the baseline gave Precise an 11-10 lead. Fifteen points later, Yoshida opened the Precise advantage to 35-17 at the break. Yung, Zach SooHoo and Yoshida blew the lead out to 56-35 with 9 minutes left in the game. 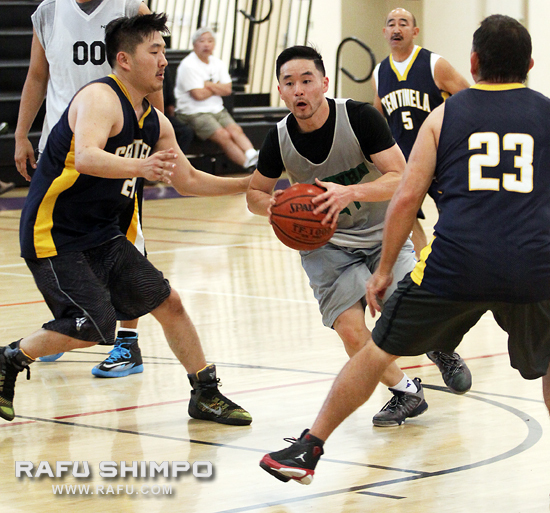 Yoshida popped in 31 points, Yung added 20 with 11 rebounds and SooHoo hit 13. Ryan Kochiyama was the only bright spot for 38 Degrees as he finished with 24 points on 10 for 22 shooting. Offensive Rebounds (11): Noguchi 4, Wong 4. Blocked Shots(6): Fujino 2, Kochiayama, K. Sugita, Noguchi, Wong..
Turnovers (10): E. Sugita 5. Offensive Rebounds (8): Murakami 3. Blocked Shots (1): K. Okumoto. Turnovers (10): K. Okumoto 4, Yung 3. Rebuilding their roster in the past few years, Marina Tiger’s youth bested the veterans of Centinela Black, 58-48. Tigers showed a man defense and slashed through the Centinela zone. Black targeted the paint early but did not have much success. Dean Wake, Darren Wake with two treys and Kai Yamamoto spirited Marina to a 23-10 lead. Centinela’s Eric Koh did some inside damage but that could only match the fast-moving Tigers. The half ended with Marina ahead, 33-18. Centinela went back to their game plan and Mike Nagata responded. Tigers more than matched as Dean Wake was all over the court. The score favored Tigers 49-32 with 5 minutes left. Black went on an 11-zip run as Briyan Shin got hot and closed to 49-43. Marina started working on the clock, forcing Centinela to foul. Tigers made 9 of 14 free throws in the final 3 minutes to clinch their victory. Offensive Rebounds (14): Nagata 3. Steals (10): Shin 4, Tashiro 3. Turnovers (12): Kaite 3, Castillo, 3 Shin 3. Offensive Rebounds (14): Yamamoto 4, Tsukihira 3. Steals (4): Dean Wake 3. Blocked Shots (3):Yamomoto 2, Dean Wake. Turnovers (18): Dean Wake 9, Kim 4.